The 1911 Philadelphia Athletics season was a season in American baseball. 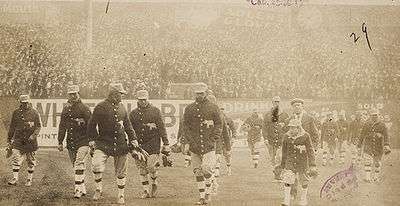 The A's finished first in the American League with a record of 101 wins and 50 losses, then went on to defeat the New York Giants in the 1911 World Series, four games to two, for their second straight World Championship. Starting in 1911, the team was known for its "$100,000 infield", consisting of John "Stuffy" McInnis (first base), Eddie Collins (second base), Jack Barry (shortstop), and Frank "Home Run" Baker (third base) and as well as pitchers Eddie Plank and Charles "Chief" Bender. 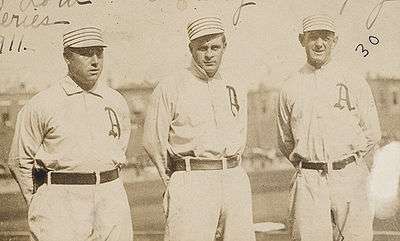 L to R: outfielders Bris Lord, Rube Oldring, Danny Murphy in 1911. Wikimedia Commons has media related to 1911 Philadelphia Athletics season.